The German Army had been equipped with a number of different tanks prior to its invasions of its neighbouring countries, which were inferior in design, but proved successful in battle due to Germany’s superior battlefield tactics. After its invasion of Russia, German forces went up against the highly successful T-34, which proved superior to the Panzerkampfwagen IV and its 75mm main gun. The arrival of the Panzerkampfwagen VI Ausf. E (nicknamed the Tiger Tank) and its 88mm cannon in 1942, couldn’t come soon enough. The need for a heavier battle tank had been foreseen early on before the break out of World War II, design and production of prototypes of a 35ton heavy tank had begun in 1937 by several German arms manufacturers at Hitler’s request. The design specifications for the new tank changed to 45 tons and the main cannon was increased to a calibre of 88 mm rather than the original 75mm after German forces encountered the T-34. Porsche and Henschel both produced prototypes and the Henschel manufacturer’s design was the one chosen for production, which began in August 1942, and by the end of August 1944, 1355 had been built. Porsche had already built some 90 odd of its tank, the VK4501, or Tiger (P). These were adapted into the Ferdinande/Elefant tank destroyers, by building an armoured citadel on top of the hull. Into this was mounted an 88mm gun. Tiger 1’s armour was crude, with vertical surfaces, but was an impressive 102mm thick at the front and 80mm on the rear and sides and proved impervious to allied firepower at the time. The M4 Sherman, with its 75 mm cannon could take out a Tiger at close range with a lucky shot to the side. The British Sherman Firefly could also take out the Tiger 1 from the front at over 1000m, using its 17 Pounder Anti-Tank gun. The Russian T34’s 85 mm gun could penetrate the Tiger from the side at over 1000 m and the 122 mm gun of the later introduced heavy JS-II tank could destroy the Tiger at ranges exceeding 1000m from any aspect. The Tigers biggest disadvantage was its weight. Despite Russian tanks sloping their armour which meant that 50mm or 40mm thick armour could be made into 100mm or 80mm thick making the tank lighter, German designers had been late in picking this up and simply used vertical 100mm/80mm thick armour. The added weight created several problems, mostly the stress and strain on the tanks working parts, which made it some what unreliable. The weight also meant that it was too heavy for most bridges, so its design allowed it to ford through water up to 4m deep, which required unusual mechanisms for ventilation and cooling, which meant more mechanical parts requiring maintenance, this system was abandoned in later years. The weight also meant the introduction of new and complex technologies, which included the hydraulically-controlled pre-selector gearbox and semi-automatic transmission. The engine was a 21-litre 12-cylinder Maybach HL 210 P45, which generated 650 hp. Although it was a good engine, it was replaced after the production of the 250th Tiger with the up rated HL 230 P45 which generated 700 hp giving it a top speed of 38 km/h and an operational range of 125km. 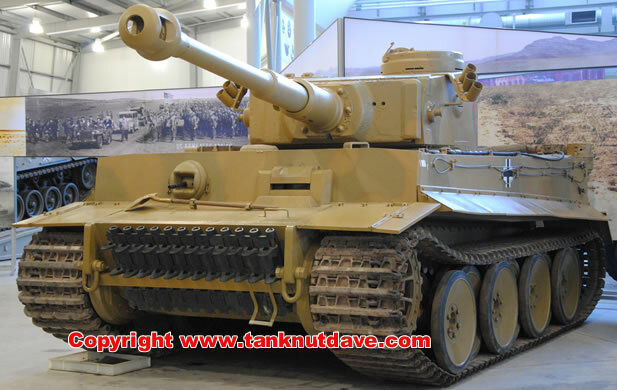 It was common place among the many mechanical problems the Tiger suffered from, that their engines would over heat, so it was a general order that no Tiger tank would engage in towing another Tiger, instead it was left to others which normally meant two of them doing it because of the Tigers weight. With its introduction to the North African campaign it dominated the Allied tanks with its superior 88mm KwK 36 L/56 cannon over the open desert plains, where it could take an Allied tank out, up to 1600m. Luckily for the Allies there was never a significant number of mechanically operational Tigers, with them in few and spread out numbers. North Africa was where the first Tiger tank was captured by the Allies. A round fired at a Tiger struck and ran along its cannon and lodged itself in the turrets ring. With the turret jammed, the 5-man crew panicked thinking it had been struck and abandoned it. The British Prime-Minster Winston Churchill and the King, travelled to North Africa to see the captured Tiger.